You must have heard much about virtualization. Virtual machines gain great popularity these days, which should owe to their ability to make managing computer instances so easy and convenient. With features like inherent portability and snapshot, users prefer virtual machines when it comes to testing and speed of scale. If you’ve tried virtual machines, you might have learned virtual machine or virtual disk is not in one unified format. The most commonly used virtual disk types are VHD/VHDX, VMDK, VDI, etc. Have you ever wanted to convert disk formats such as convert VHD to physical, convert physical disk to virtual, convert disk between VHD and VMDK, etc. In fact, it is easy to do disk converting among physical disk, VHD, VMDK and VDI, for example, convert physical VHD or VHD to physical. If you are look for a how-to guide to convert disk, then continue reading this article. In this section you can find two physical to virtual converters which can help you convert physical hard drive to virtual disk. The converting process will be discussed in next section. 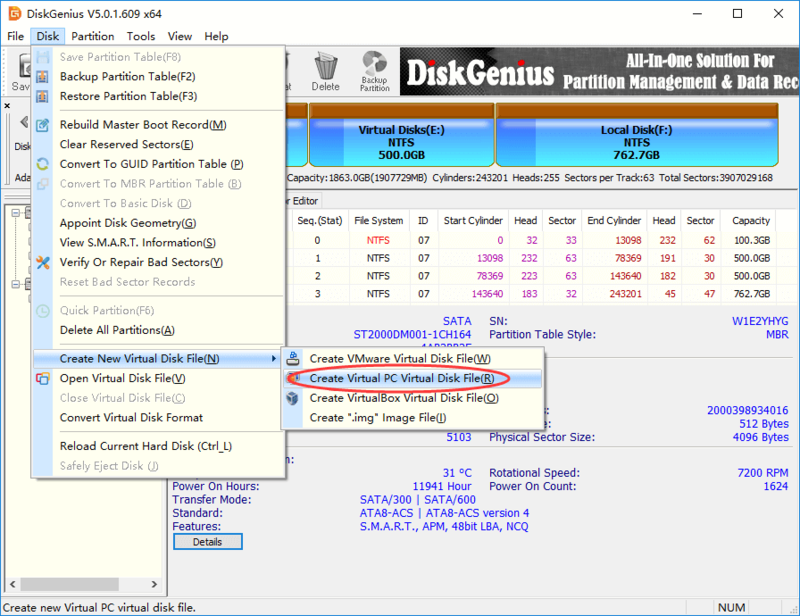 Disk2vhd, provided by Microsoft, is able to create VHD versions of physical disk for use in Microsoft Virtual OC or Microsoft Hyper-V. It makes use of Windows volume Snapshot feature and created consistent point-in-time snapshots of the volumes to be converted. DiskGenius is an all-featured tool for data recovery, disk partition, data backup and disk utilities. It provides excellent support for VHD, VMDK and VDI virtual disk. With this tool, you can create or load virtual disk, recover data from virtual disk, manage space on virtual disk, convert virtual disk format, convert virtual disk to physical or convert physical to virtual disk. Step 1: Install and launch DiskGenius from your computer. Then create a VHD disk with this software: click Disk Menu and choose Create New Virtual Disk File and Create Virtual PC Virtual Disk File. Then you can name the VHD file and set a location to store it on your computer. Step 3: Clone physical disk to VHD. Click Start button when you make sure the source disk and destination disk have been correctly set. When the cloning process completes, the converting will be dones. 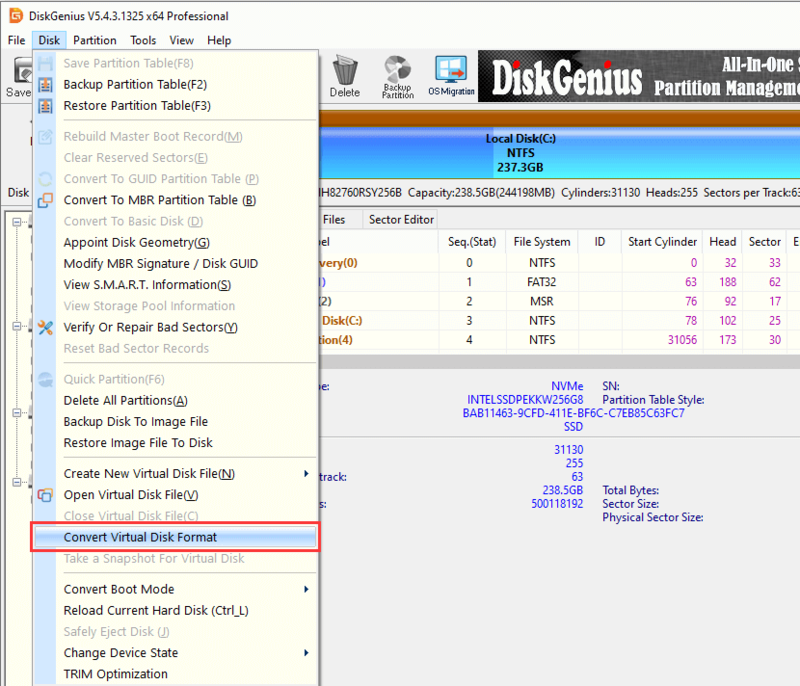 DiskGenius is able to convert virtual disk formats among VMDK, VHD and VDI without losing data. Here is the process to convert VMDK to VHD. Step 1: Click Disk menu and choose Convert Virtual Disk Format. 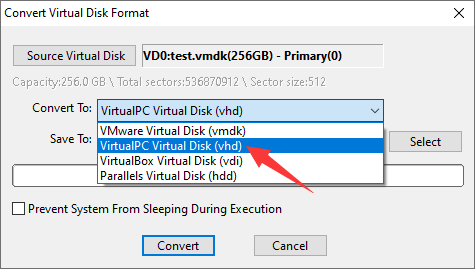 Step 3: Click Select button and set a location to save the VHD disk after converting. Step 4: Click Convert button and DiskGenius starts to covert VMDK to VHD. How to convert Hyper-V to VMware? This entry was posted in Uncategorized and tagged disk to VHD, Physical to virtual converter, VHD to physical disk, VMDK to VHD by EASSOS. Bookmark the permalink.